This is a very late post, very late. But this challenge looked like so much fun that there was no way I was going to miss it. I was travelling for a week (right when the post was due) and then you can imagine how busy work can get once you get back home. Anyways, I made the cake finally this weekend and it was delicious. I am so glad that I did not miss this challenge. The pictures do not do justice to the cake. 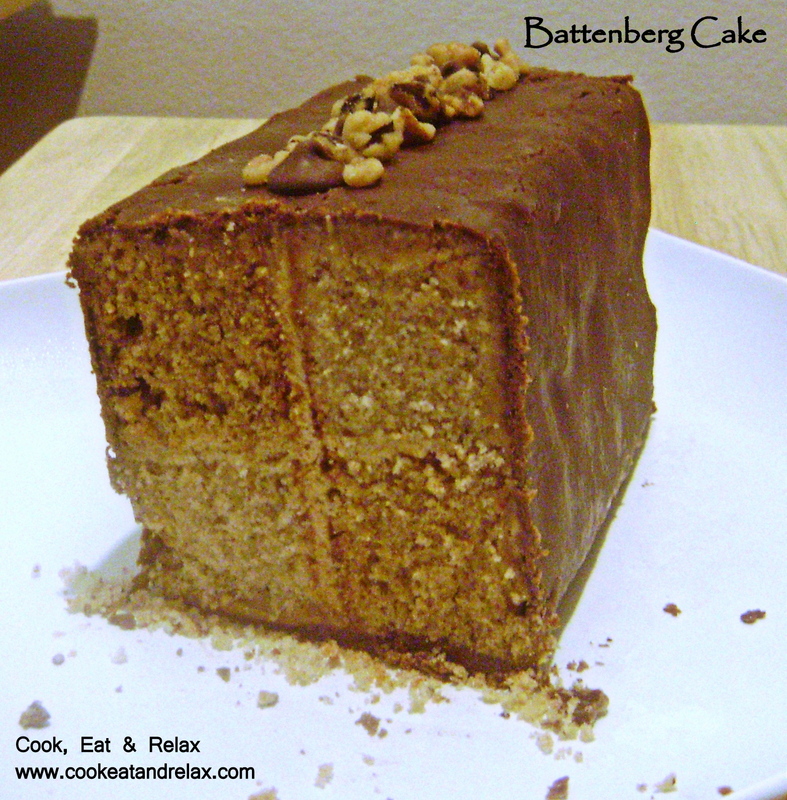 So here’s the walnut-coffee flavored Battenberg cake with chocolate plastique. Mandy of What The Fruitcake?! came to our rescue last-minute to present us with the Battenberg Cake challenge! She highlighted Mary Berry’s techniques and recipes to allow us to create this unique little cake with ease. 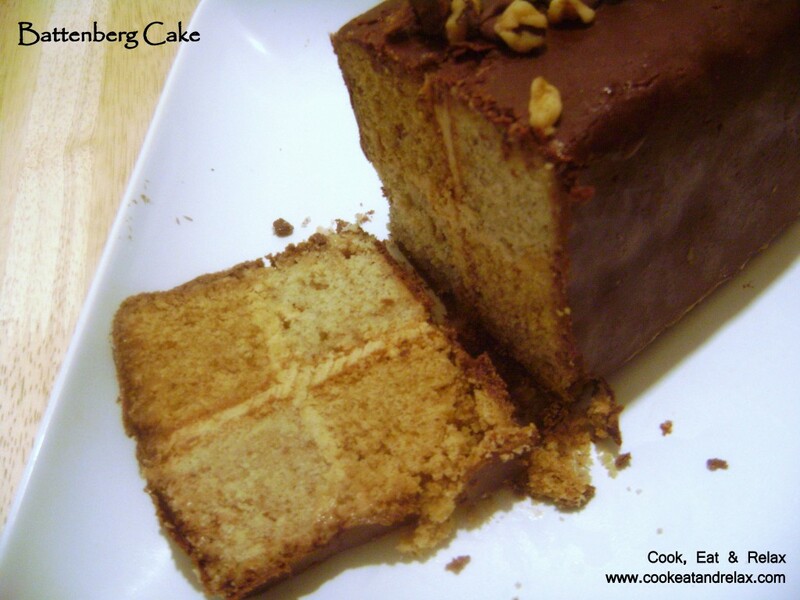 Now for some history about the Battenberg cake before we get down to the nitty gritty details. This cake has very grand beginnings. It was actually created as a wedding cake for royalty. The first Battenberg cake was made to celebrate the marriage of Queen Victoria’s granddaughter, Princess Victoria, to husband Prince Louis of Battenberg. It’s traditionally flavoured with almond and has the signature Battenberg markings, that is, the yellow and pink squares (said to represent the four princes of Battenberg). The strips of sponge are glued together using jam (normally apricot) and the whole cake is covered in marzipan. Sometimes the edges are crimped and the top is patterned with a knife. Line the tin with parchment paper, creating a divide in the middle with the parchment (or foil) – Tip: See photos or watch video above for detailed instructions or prepare Battenberg tin by brushing the tin with melted butter and flouring. Whisk together dry ingredients (except walnuts and coffee) and combine with the wet ingredients in a large bowl (except vanilla and milk) and beat together just until the ingredients are combined and the batter is smooth. Spoon half the mixture into a separate bowl and stir in the vanilla, 1½ teaspoons milk and chopped walnuts. Spoon the walnut mixture into the one side of the prepared baking tin. Dissolve the coffee in the remaining 1½ teaspoon milk and add to the remaining batter, stir until just combined. Spoon the coffee batter into the other half of the prepared baking tin. Smooth the surface of the batter with a spatula, making sure batter is in each corner. Bake for 25-30mins until the cake is well risen, springs back when lightly touched and a toothpick comes out clean (it should shrink away from the sides of the pan). Leave to cool in the tin for a few minutes before turning out to cool thoroughly on a wire rack. Once completely cool, trim the edges of the cake with a long serrated knife. Cut each sponge in half lengthways so that you are left with four long strips of sponge. Combine the buttercream ingredients together and mix until combined. 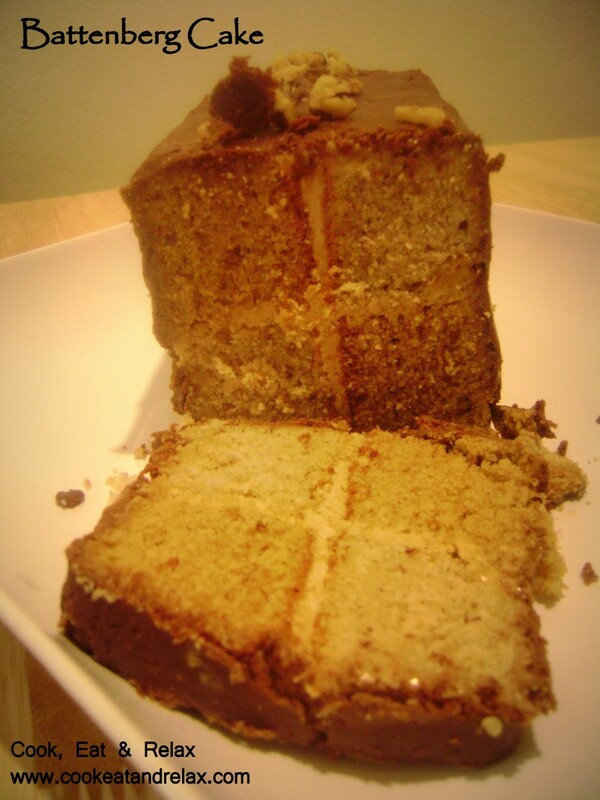 Spread a thin layer of buttercream onto the strips of cake to stick the cake together in a checkered pattern. Dust a large flat surface with icing sugar then roll the chocolate plastique in an oblong shape that is wide enough to cover the length of the cake and long enough to completely wrap the cake. Spread the top of the cake with a thin layer of buttercream. Place the cake on the chocolate plastique, buttercream side down. Spread buttercream onto the remaining three sides. Carefully flip the cake over so that the seam is under the cake and score the top of the cake with a knife, you can also crimp the top corners with your fingers to decorate. Neaten the ends of the cake and remove excess marzipan by trimming off a small bit of cake on both ends to reveal the pattern. Melt the chocolate in a double boiler or in a heatproof bowl over a pot of simmering water, stir occasionally. Once completely melted, remove from heat and allow to cool a bit. Stir in corn syrup / glucose syrup / golden syrup, it will seize up almost immediately, just keep stirring until mixed and it comes away from the side of the bowl. Transfer chocolate into a sealable bag, spread the chocolate out then seal the bag. Leave overnight or refrigerate for about 2 hours until completely firm. Turn out from the bag and knead on a surface dusted with powdered sugar, at first it will just break , but as you knead, it will warm up and start to become pliable. Knead until it’s pliable enough to roll out or mould, 5 – 10mins. I hope you enjoy this recipe as much as I did. It is a beautiful looking cake and is delicious. And I can already think about a hundred variations on this. The cake itself, buttercream and the covering can all be varied to result in different kinds of cakes. And this cake is not a very big one. It results in about 8-10 slices so if you are baking this for a party, you can easily make 2-3 of them in different variations and I can promise you that it will be a big hit. Thanks once again to the daring bakers for the wonderful recipe. This is one delicious combination. I always knew that grilled shrimp is beyond delicious, but grilling peaches with shrimp, takes the shrimp to a whole new level. I was grocery shopping after coming back home to an empty refrigerator after my awesome California vacation and I saw the deveined shrimp shell on and my creative juices decided to help me out. I picked up all the ingredients and came up with this recipe as I walked through the grocery aisles. 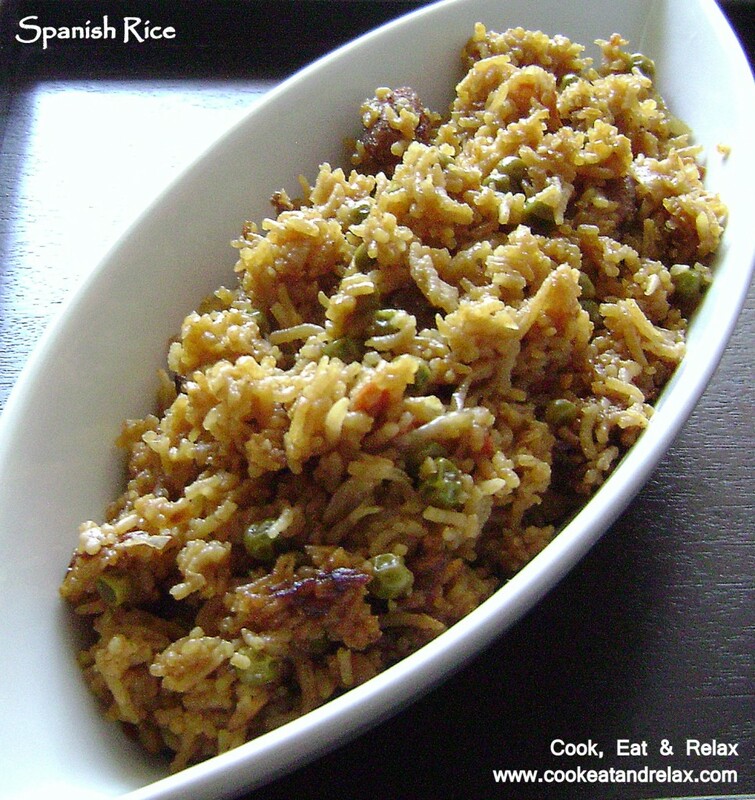 Not too many ingredients and you will definitely find many of the ingredients at home. So what’s not to love about this recipe. And it’s summer so why not fire up the grill and try out this recipe. This list of ingredients made about 7 skewers of grilled shrimp and peaches. First make the flavored olive oil by heating the oil and adding the minced garlic, crushed red pepper and whole black pepper. Heat the oil till the garlic is slightly browned, now strain the oil out and add the garlic, and peppers to a food processor. Next add the cilantro leaves, honey, 3 tbsps of olive oil, lemon juice, rock salt and deseeded habanero chilli. Mince the ingredients together and add some more olive oil if the mixture is too dry. Marinate the peaches and the shrimp in half the marinade for about half hour. 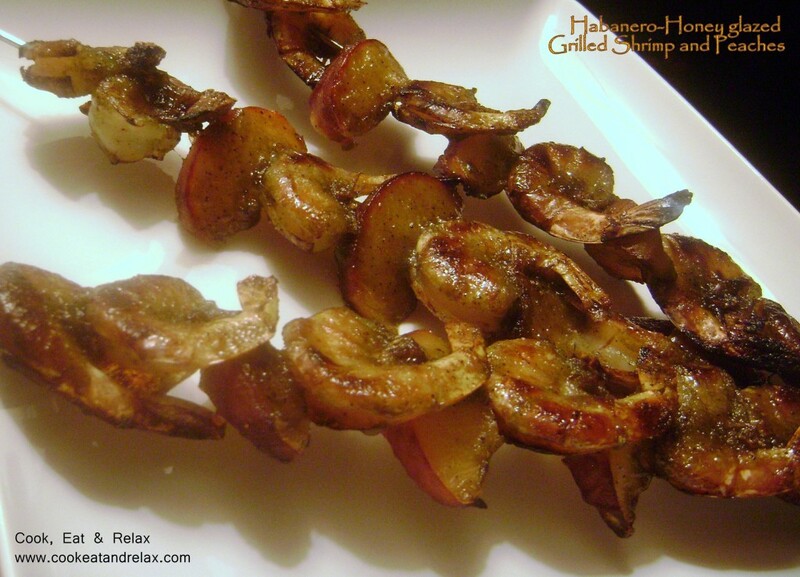 Skewer the deveined but shell on shrimp onto metal skewers with the peaches and grill the shrimp and peaches either on a grill or on the broil setting in the oven. Turn the skewers over after about 5-7 mins. 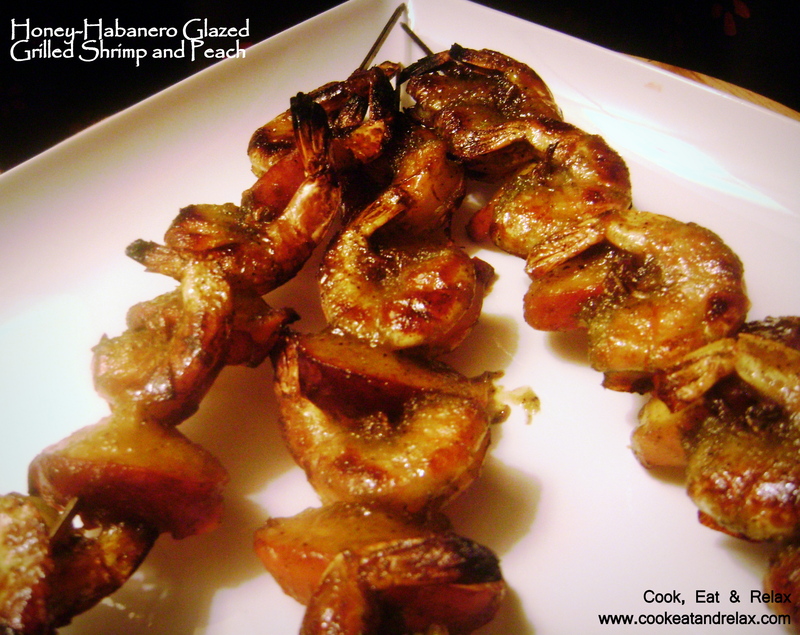 Baste each side of the skewer with the leftover marinade. 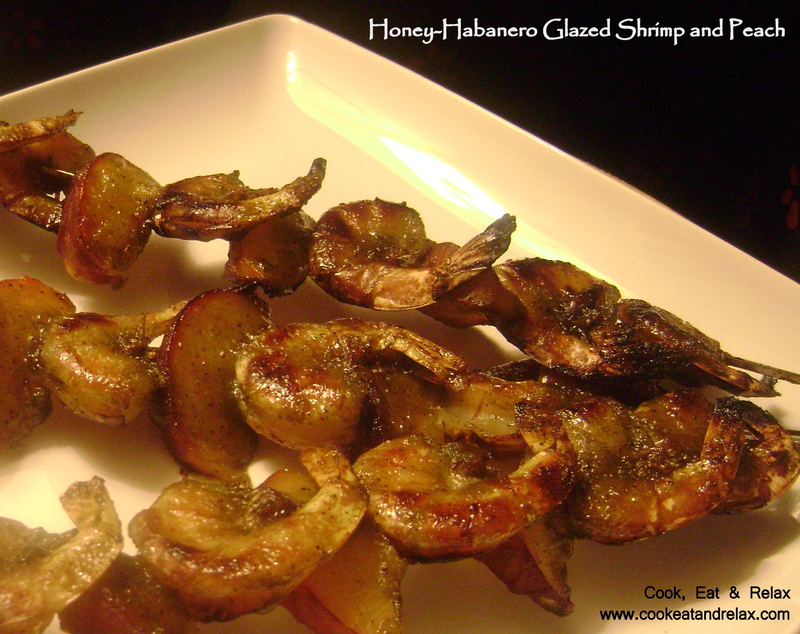 The grilled shrimp and peaches are ready to be devoured. Though I say so myself, this was one of the most awesome shrimp dishes I have ever had. Grilling it with the shell on ensured that the shrimp did not dry out and make sure that the peaches are skewered through the skin. This ensures that the peaches do not disintegrate. You could make it spicier by adding more habanero chilli. This was one of the easiest dishes to make and I now wish I had a grill. So if you have a grill fire it up and try this recipe. I promise you will not regret it. And once again thanks for reading my blog. 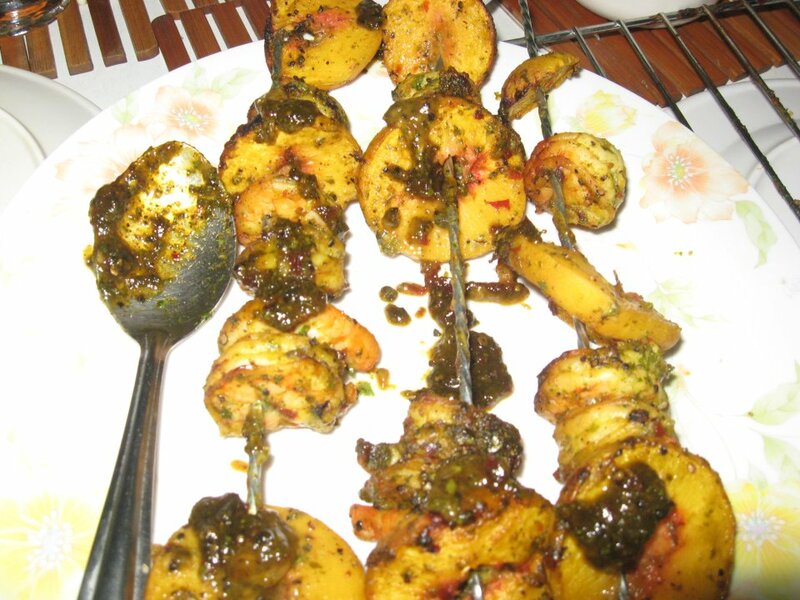 Photo courtesy my aunt, Geetha, after she tried the recipe…. A very simple and easy to make dish. This is going to be a very short post. My absence from the blog world is thanks to my dissertation writing and that literally means that I have absolutely no time to update my blog. Which is kind of sad as that’s how I relax at the end of the day. But well, my PhD degree is a priority now but this recipe turned out so awesome that I really could not not write it up and blog about it. It took me about 20-30 mins to prepare (which excludes the time it takes to boil the peas). This recipe would serve 2 persons. Cook the peas in the vegetable stock and some water. Heat the oil in a saucepan and add the mustard seeds and cumin seeds. Once they start to sputter, add the asafoetida, turmeric powder and curry leaves. Next add the garlic paste and fry for a few mins till the raw smell of garlic disappears. Next add the chopped green chili and tomato and cook till the tomatoes and mushy and soft. Now add the cooked peas and tamarind paste and bring to a simmer. Next add the red chili powder, black pepper powder and salt to taste depending on how spicy you want the dish. Simmer the curry for about 5 mins. Next add the coconut milk and simmer for a couple of mins. Do not bring it to a boil once you add the coconut milk. You could skip the coconut milk if you do not like or want to add coconut milk. 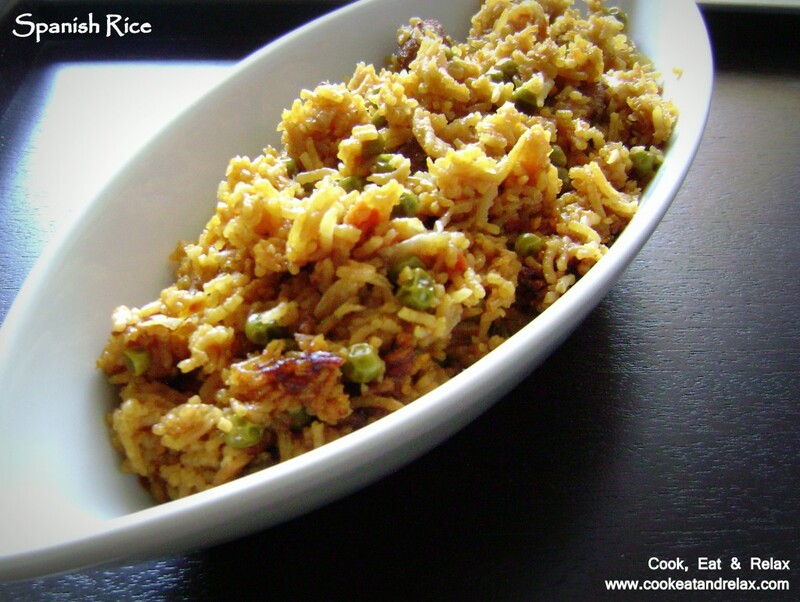 But make sure that you reduce the spice if you are not adding the coconut milk. Thanks for reading my blog and sorry about the short post but the choice was between not writing at all or writing a short blog. I chose the latter and I think I am all rejuvenated to work on my dissertation once again… And you can serve this with some rice or any bread. In fact I just had it plain with some salad. Quick, easy and healthy! Bon Appetit! 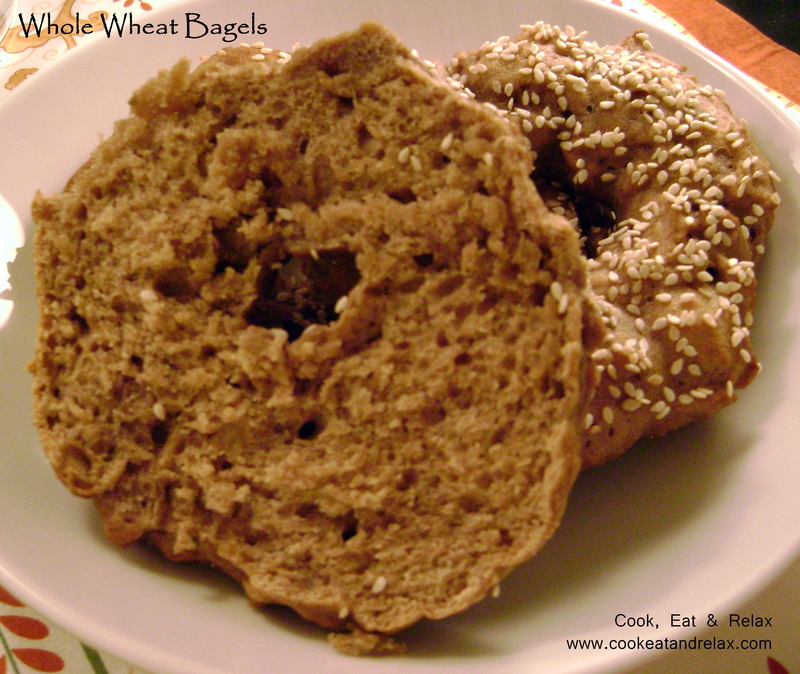 Baking bagels is really easy…. I never thought I would say that. But seriously they are. I love bagels anytime of the day, breakfast, lunch, snack or dinner. I love them with cream cheese, with pesto or even as a sandwich. So when I saw a show on TV the other day where the cook was baking bagels, I thought that I could do that. Sorry, but I do not remember the show or the cook’s name. I remembered the technique he used and just used the bread from the whole wheat bread I made the other day. The dough for these bagels was made using the recipe here. And sorry about the pictures, I was in a hurry and did a rather bad job with the pics. But the bagels were awesome! The dough was in the refrigerator for two days after I made the whole wheat bread. I used the other half of the dough that was left in the refrigerator to make four bagels, 1 1/2 of which I finished before I actually took the pictures. Therefore the 2 1/2 bagels in the pictures. Well I am allowed to have more than one, I had a very light lunch. Make the dough as instructed in the whole wheat bread recipe, here. The day you are baking the bagels remove the dough from the refrigerator and separate the dough into peach size balls. 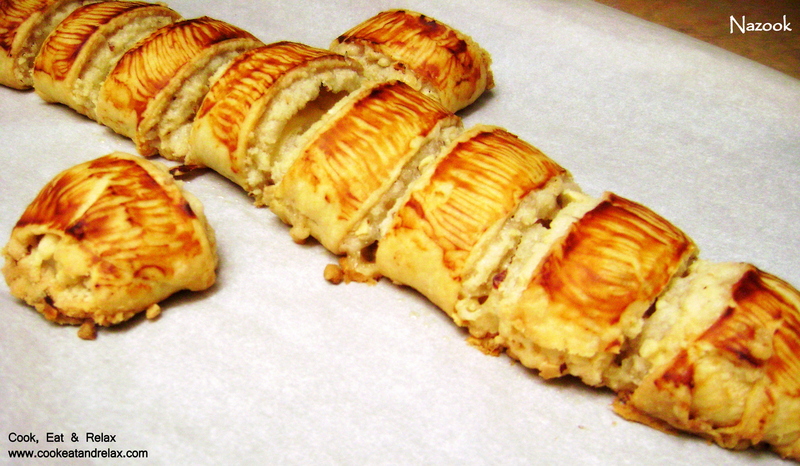 Take each ball of dough and bring together the ends under the ball. Next make a hole in the center of the ball, about 1.5″ – 2.0″ in diameter. Place the bagel on a parchment paper. Place a plastic wrap over the bagels and let it rise for about 20 mins. About 15 mins in to the rising time, place a large saucepan filled with water and bring to a boil. At the same time place a baking stone (if you are using one) in the oven and pre-heat the oven to 425F. Let the oven pre-heat for about 30 mins if using the baking stone, if you are using a baking pan lined with parchment paper for baking the bagels, you will not need 30 mins. Once the water come to a boil, add 1/2 cup of sugar and 1 tsp of baking soda to the water and reduce the boil to a simmer. Add the bagels one at a time (or more) making sure that the bagels are not touching each other. Cook the bagels for one minute on each side and take it out of the water and place it on a parchment paper sprinkled with cornmeal. 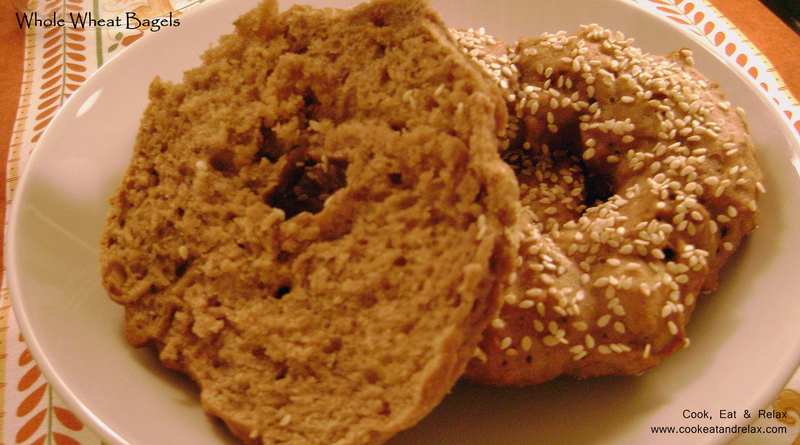 I sprinkled some sesame seeds on top while the bagels were still moist (right after removing from the boiling water). Once the oven is pre-heated, move the bagels from the parchment paper to the baking stone (if using one). Else just transfer the baking pan to the oven and bake the bagels for 20-25 mins or till the outside is browned and crisp. Voila, the bagel is ready to be devoured warm. These can be baked and toasted when ready to eat as well. The bagels were delicious, chewy inside and crispy crust on the outside. I promise, you will love these homemade bagels. They are healthy as well, whole wheat, and yes just a little bit of all purpose flour. The texture was brilliant and the taste was awesome too. Give it a try and I promise you, the store bought bagels will never taste good enough. At last a successful everyday bread with 5 mins of prep time. A very useful resource I found online is the King Arthur Flour website. They have a brilliantly written blog as well, very detailed and very nice recipes. 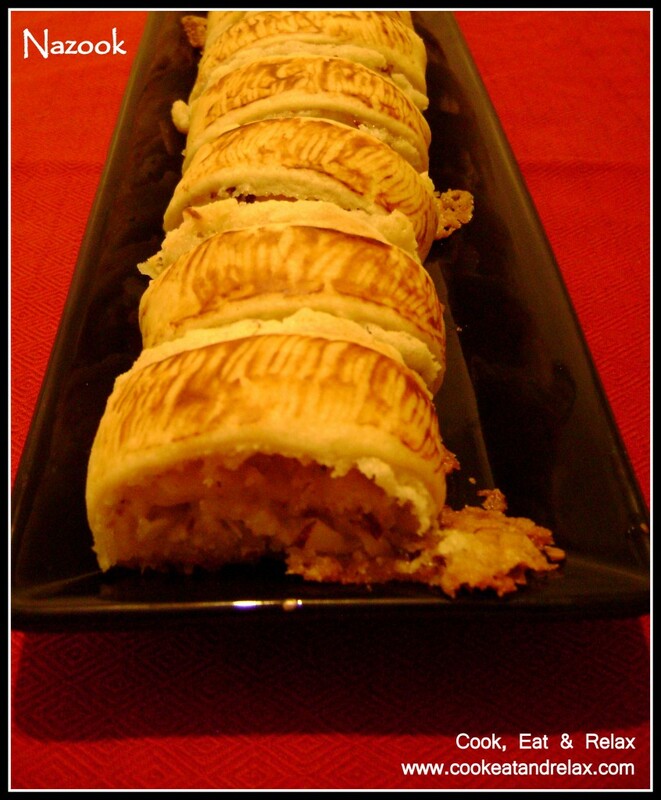 At least the two recipes I have tried till now are perfect and I am going to make them again and again. That’s where I discovered the brilliantly written book – Healthy Bread in Five Minutes a Day: 100 New Recipes Featuring Whole Grains, Fruits, Vegetables, and Gluten-Free Ingredients by Zoe Francois & Jeff Hertzberg MD. They have very nice recipes and they also give very detailed instructions on what kind of flour to use and how to handle the dough etc. A must buy book if you are interested in baking bread at home. Now let’s get to the recipe. This makes about two 1 pound loaves. Mix all the ingredients together in a large mixing bowl or a dough tub. Cover the bowl and keep it outside for 2 hrs at room temperature. I left it outside overnight and let it rise. The next day morning before leaving for work, I moved it into the refrigerator. In the evening or anytime in the next 14 days cut out a grape sized piece of dough and form a ball of it without kneading or punching down the dough. You want all the air to remain in the dough, this leads to a nice light loaf. Stretch the dough out a little to form an almond shaped loaf. Transfer the dough ball onto a silicone mat, pizza peel sprinkled with cornmeal or parchment paper. Now let the dough rise for about 90 mins. About 60 mins into the rising time, place the baking stone in the oven and pre-heat the oven 450 F.
Place an empty metal broiler pan below the baking stone. At the end of the rising time, place the bread on the baking stone. If using the silicone mat, transfer the bread into the baking stone directly after 2/3 time into the baking time. Bake the bread for 30 mins or till the bread crust is browned. Cool the bread on a cooling rack for about 20 mins and then cut it into slices. Voila here’s the bread ready to be devoured any way you wish. I made some pesto egg salad and made an egg salad sandwich. The fact that this is fresh bread, elevated a simple egg salad sandwich to a whole different level! And this tastes good just toasted with soe butter. And you can use the rest of the dough as and when you want or bake it all in one go. I can bake fresh bread at home anytime I feel like now. 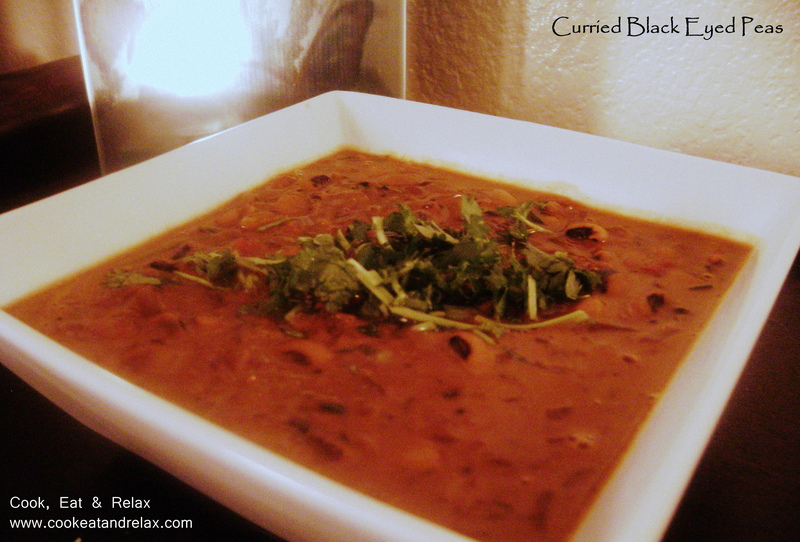 Thanks for reading my blog and hope you enjoy this recipe. I have always loved the idea of baking bread at home. But yeast and I were never good friends. But ever since I joined the daring bakers, I have been able to overcome this fear. I have baked quite a few breads with yeast and have got it right. But I have never tried out recipes outside of the Daring Bakers. I thought it was about time to venture out on my own and see if the training through the Daring Bakers group had paid off. And must say, it definitely has. I was more confident in what I was doing and knew how to pick a good recipe and voila I managed to bake the perfect baguette with apples and walnuts. And to add to it, it goes perfectly with cheese fondue. 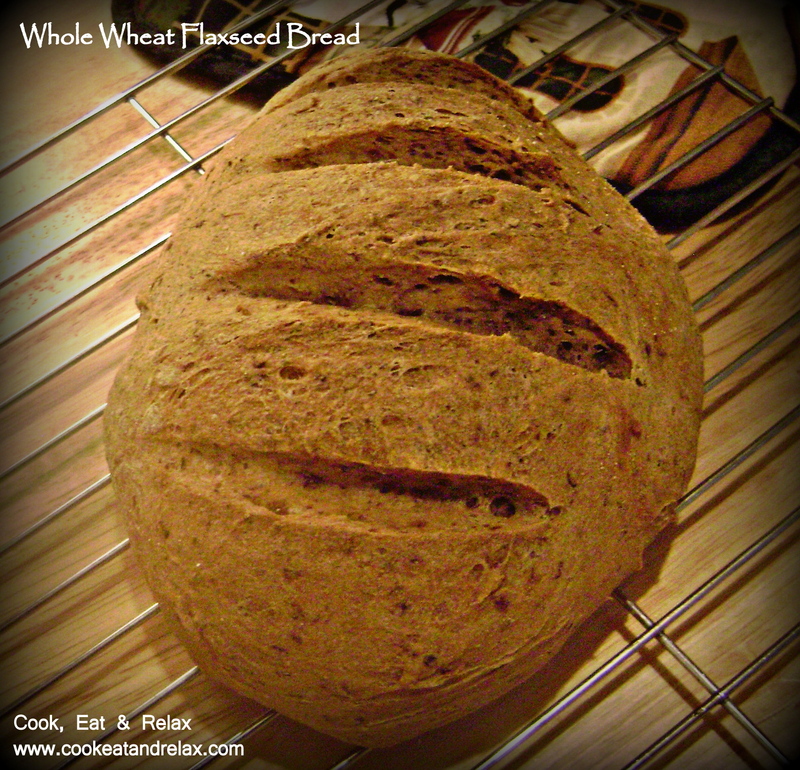 I found this recipe at http://www.kingarthurflour.com/blog/2010/02/11/whats-the-best-possible-way-to-serve-this-bread/. I loved the detail in which she goes and that really helped with my making the perfect baguette. The bread is really easy to make and takes about 5 mins on day one when you make the starter and about 20 mins of active time on the second day when you actually knead and shape the bread. And yes I did buy the special pan (baguette pan) for the bread and it was a good decision. 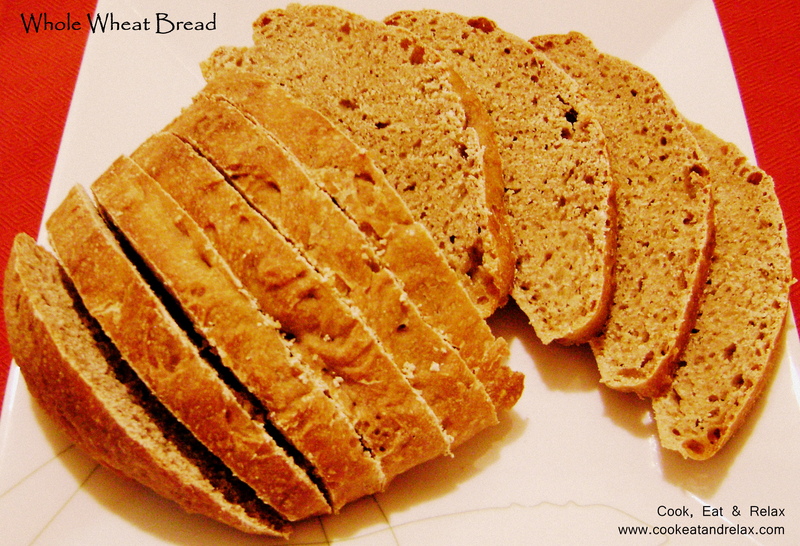 The bread had a great crust and was flavorful and moist and soft inside. 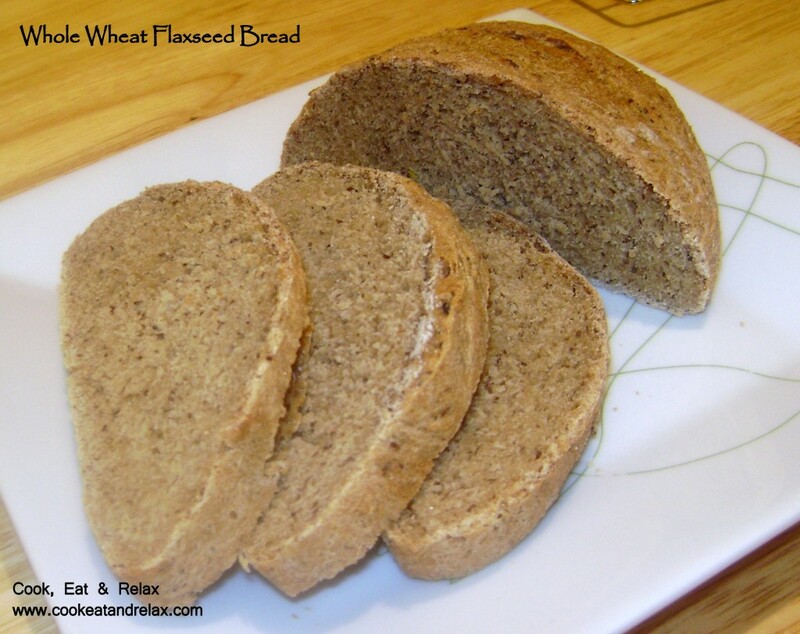 The rye flour added to bread adds a nice flavor to the bread. This makes two small or one large loaf of the bread. 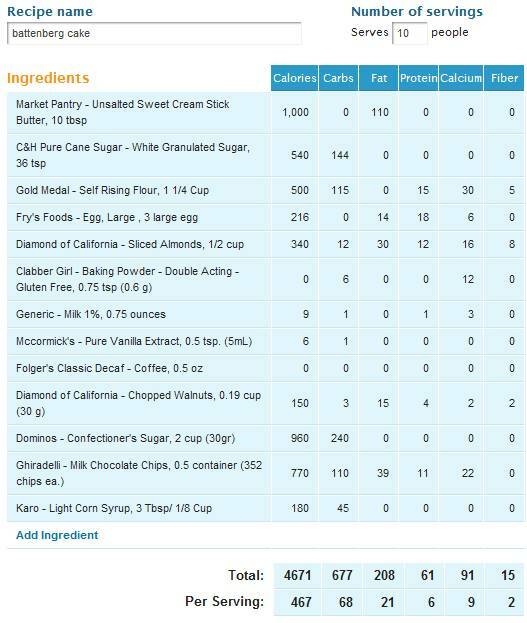 Mix the ingredients listed under started in a mixing bowl and keep it aside for 12-18 hrs. Next step would be to add the rest of the flour, salt and yeast to the starter and make a soft dough. I did the kneading with my hands and did not use a stand mixer. You could use a stand mixer if you have access to one. 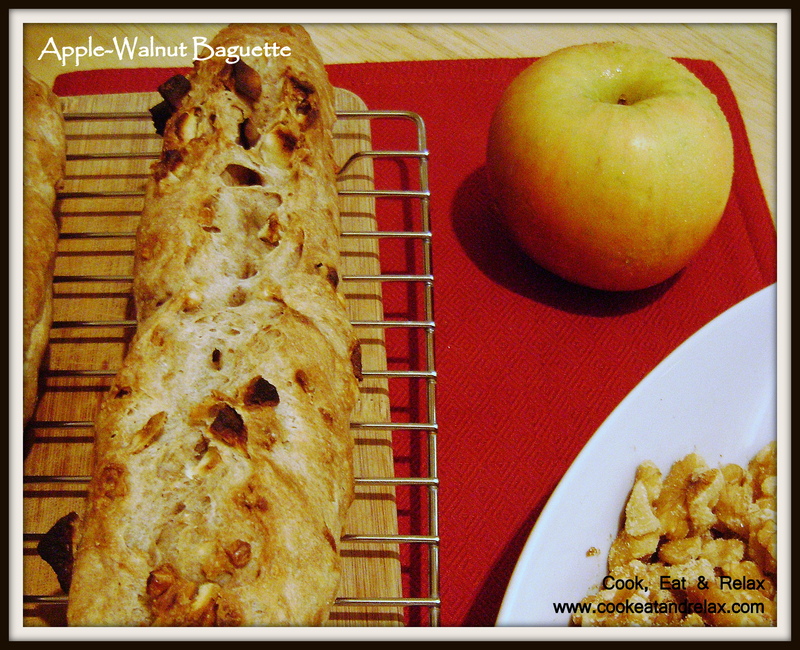 Next add the dried apples (do not use fresh apples as the moisture in apples will cause the bread too soggy) and the walnuts to the dough and knead them into the dough. You don’t need to knead the dough too much. 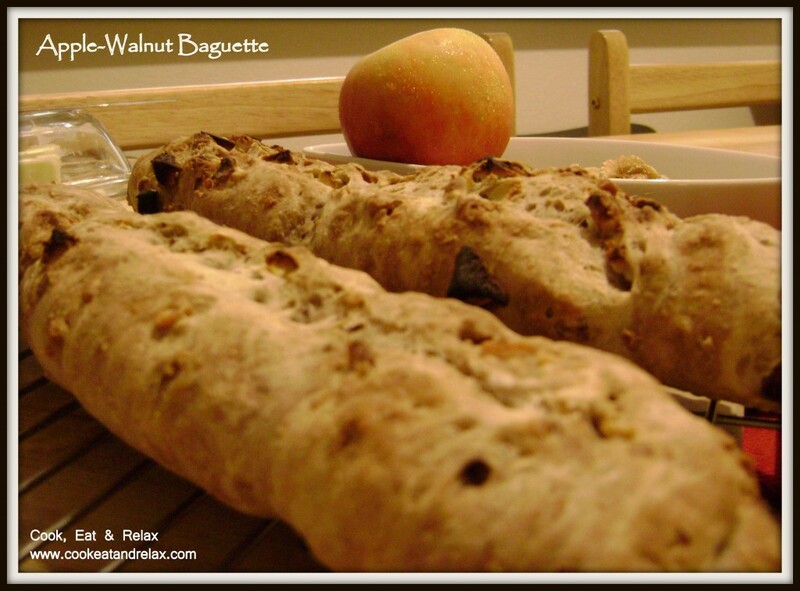 Just make sure that all the walnuts and apple pieces are incorporated with the dough. Now transfer the dough to a lightly greased bowl and let the dough rise for 60-90 mins or till the dough has doubled in size. 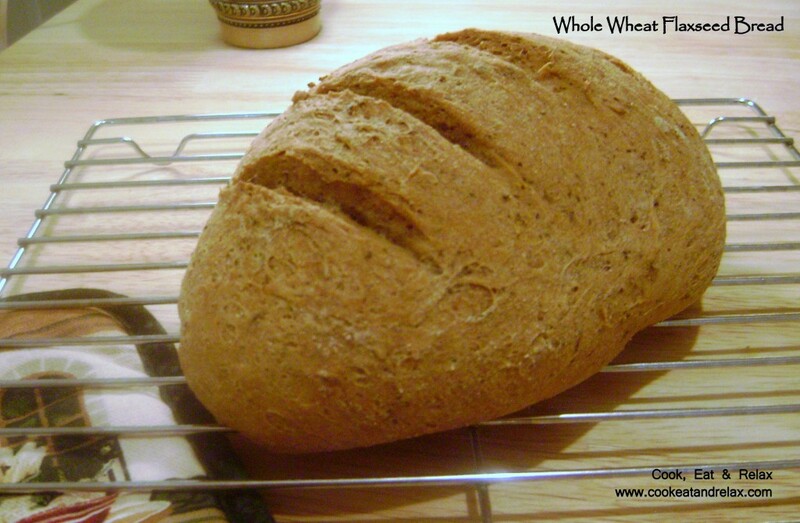 Once the dough has risen, divide the dough into 2 parts or use all the dough to make one loaf. Roll the dough out into an oval shaped piece about 12″ long and 4-6″ wide. Fold the dough along the long side and seal the edge using the heel of your hand. Repeat this once again. Now shape the dough by tapering the ends. 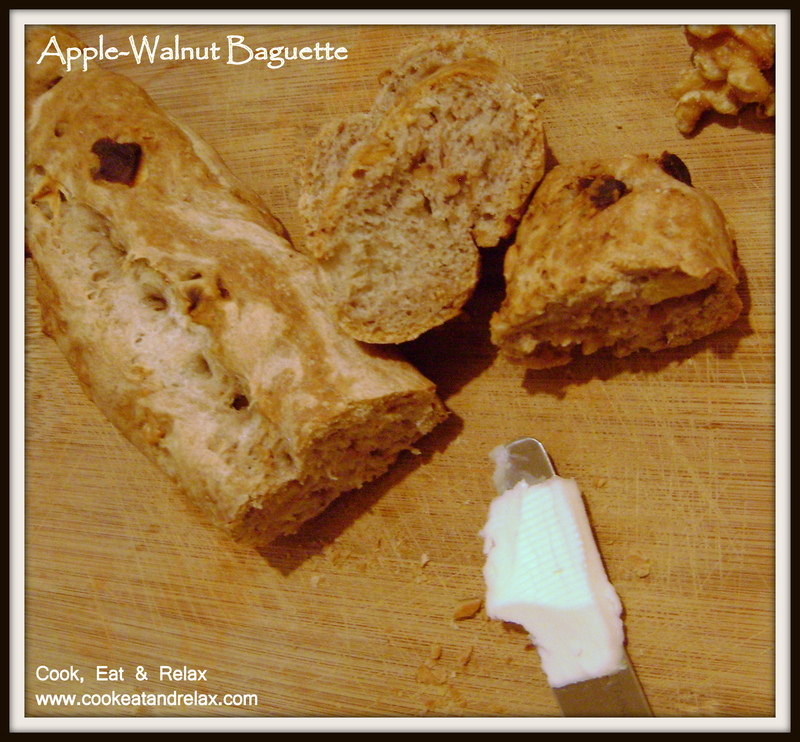 Now transfer the dough to a greased baguette pan or onto a parchment paper on a baking sheet. Cover the loaves and let it rise for another hour or so. In this time the dough will get puffy. When the dough is almost risen, pre-heat the oven to 425 F.
Now spritz the loaf with some water and make a long slash on the loaf/loaves and transfer it to the oven and bake in the oven for 25 mins or till the bread is browned. Transfer the bread to a cooling rack and let it cool completely before cutting it. I loved this bread. I know I am going to try out healthier versions of this bread. 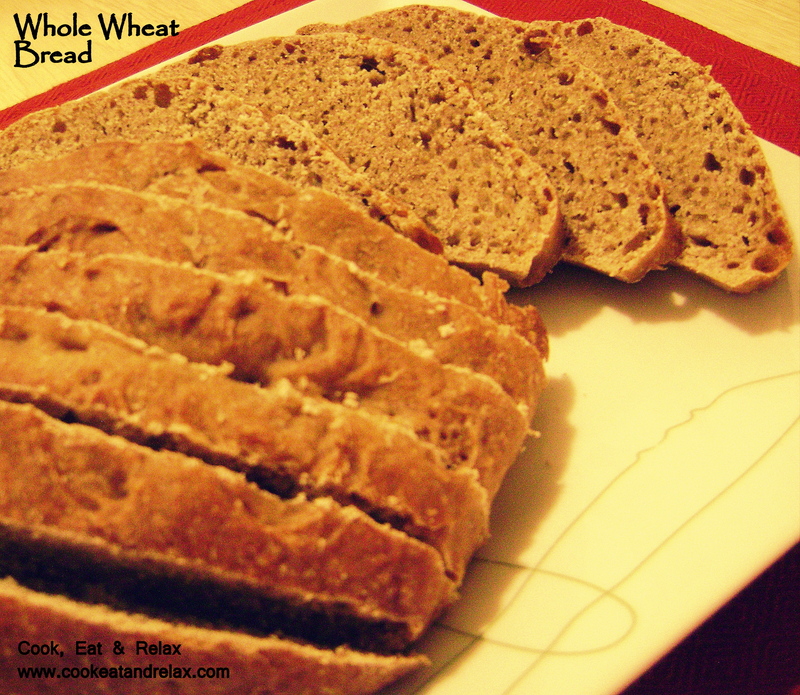 I loved the rye flavor and am sure you will love it too. The crust is nice and brown and the inside of the bread is soft and fluffy. I had this bread with butter and also had it with pasta. It was absolutely delicious. I hope you love it too and a big thanks to blogger at the King Arthur Flour blog. The recipe is awesome and the instructions were brilliant. I have never had an asparagus, leek and peas soup. So I had no idea how this was going to turn out. And the reason I came up with it was because I bought leeks the other day and wanted to use it in a soup but then landed up using up the other ingredients which were to be part of the soup for other dishes… So now I was left with the leeks and no soup. I decided to make roast some asparagus for lunch and had the ends (the thick not roastable parts) on my cutting board. This time I decided not to throw it out, instead decided look up recipes which would actually allow me to use the ends as well. That’s how I landed up at one of my favorite blogs: What’s for lunch honey. 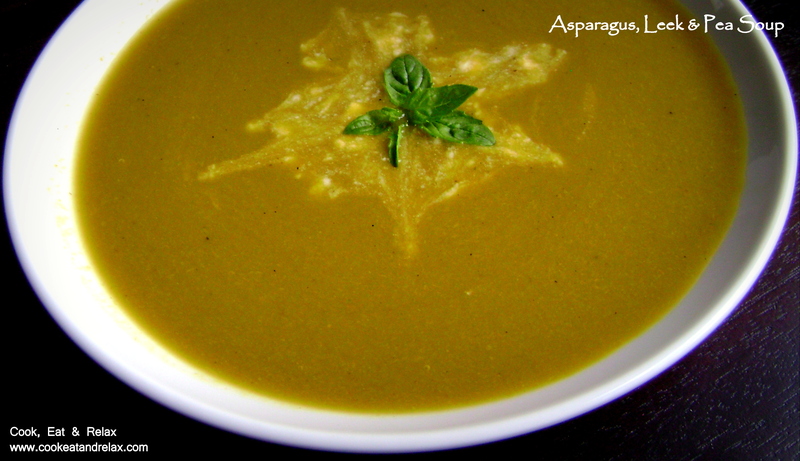 And Meeta had a wonderful looking soup she had there with asparagus ends. 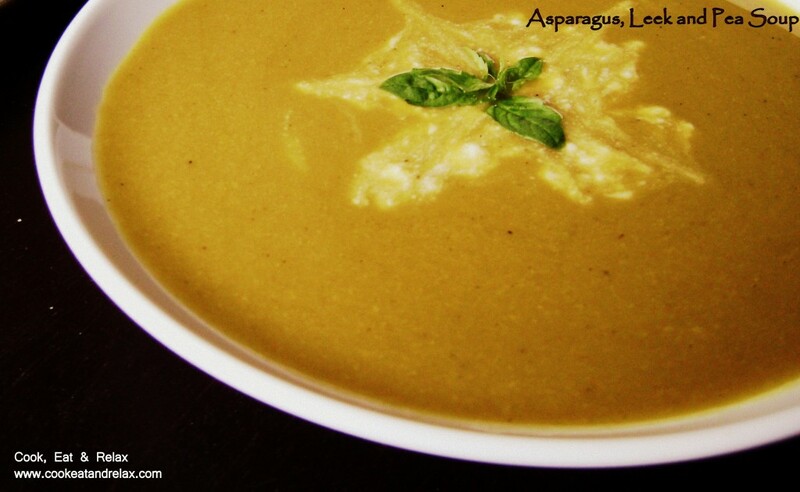 I modified the recipe (http://www.whatsforlunchhoney.net/2006/05/creamed-asparagus-and-leek-soup.html) to create one of my own. And this soup is creamy, surprisingly so! It takes hardly any active time of yours. I just steamed the asparagus ends in a rice cooker with the steamer. And then once it was all softened, i just tossed the ends along with the peas into the same water and let it boil for sometime and I did not have to keep an eye on it. 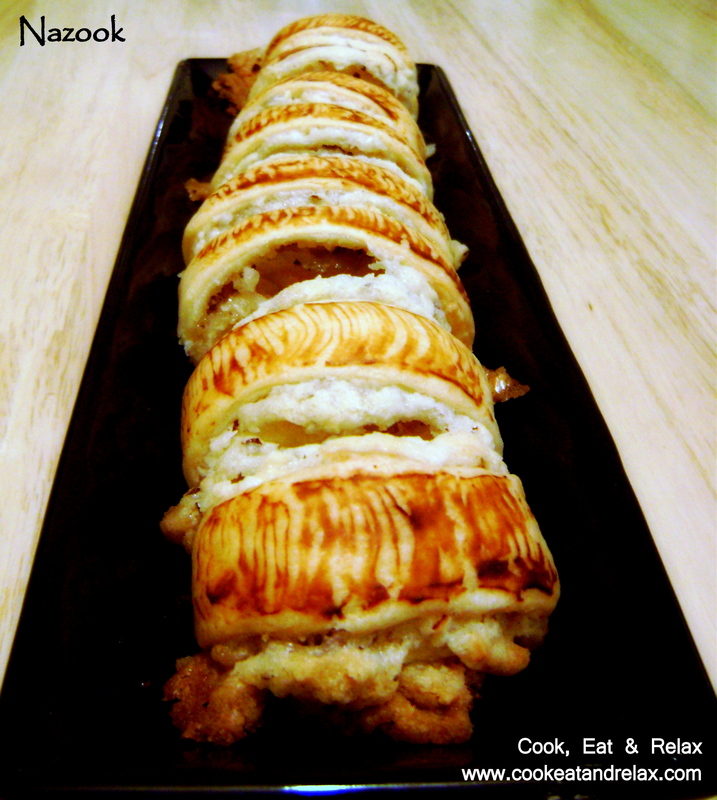 So here’s the recipe and it serves about 2-3 persons. Steam the asparagus ends using about 3 cups of water for about 15-20 mins. Next toss the ends and the peas into the same water and let it simmer for another 15 mins. In the meanwhile heat the olive oil and butter in a saucepan and add the leeks to it. Saute the leeks till it is browned slightly. This took about 15 mins. Now transfer the asparagus, peas and water to the saucepan and let the ingredients simmer for 5 mins. Now transfer this to a blender and blend it. Next use a strainer to strain out the soup and place the soup back on the stovetop. Now add the red chili powder, salt and pepper and bring to a boil. Transfer the soup to serving bowls and top with yogurt. Serve hot with some croutons (I did not use the croutons). I loved the soup. It was delicious and amazingly so given the fact that I had put just salt and pepper to it and no other added ingredients. You could add some vegetable stock to this to enhance the taste even further. But I loved it just the way it is. This is going to be a permanent feature on my menu at home now, as both Amit and I love asparagus and now we can use the ends too. 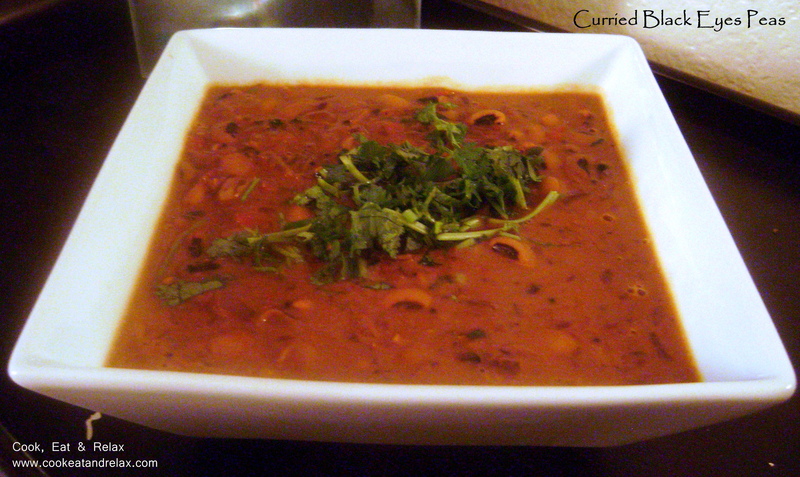 Thanks for stopping by at my blog and hope you enjoy this soup as much as I did.